The new year has begun so as the new semester! Winter break has gone fast. During the winter break, I was back in my home country, Korea. I had a wonderful time back in there and I’d like to share some of my memories. I was in Korea for three weeks and I visited a lot of places. I’m originally from Gwangju which is in the southern part of Korea. 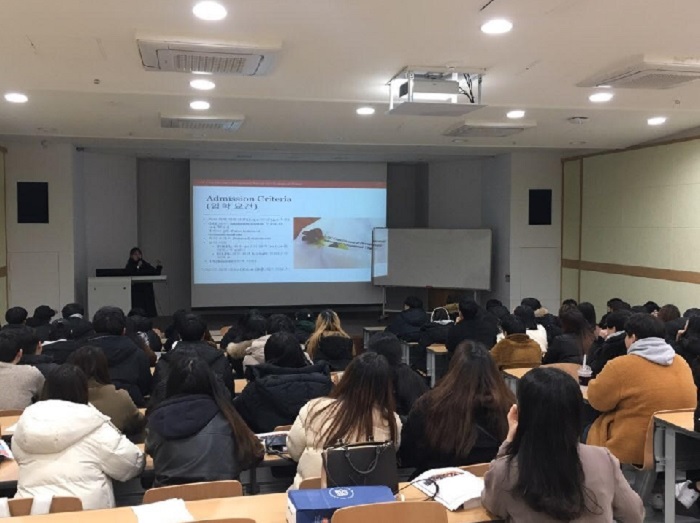 However, I went to a university in Daejeon, the middle part, so I went there to visit a professor and give a presentation about the Post-Professional Master’s Program for students at the university. Also, I worked in Jeonju before I came here, so I went there to visit the hospital where I worked and see my previous co-workers. I also went to Seoul and Daegu to visit my friends and went to Jeju Island with my family. I went so many places and I’d love to introduce every places, but this time, I’ll tell you more about the presentation that I did. I planned for this while I was in here during the Fall semester. I was contacting with the professor from the university that I went, and got a chance to present about the Post-Professional Master’s Program in the USC Chan Division of Occupational Therapy and Occupational Science which I’m currently studying as well as Pre-Master’s Program from the USC International Academy which I did before the Post-Professional Master’s Program and SOTI Program from the Global Initiatives. It was a great opportunity for me to present about the program in my country as a student ambassador in the USC Chan Division and a senior from the university in Korea. In the presentation, there were about 50 students mostly freshmen and sophomore who are interested in studying abroad. Like I mentioned earlier, I presented about the Post-Professional Master’s Program, Premaster’s Program, and SOTI Program. Also, I told them my experiences what I prepared to study in here from learning English to applying and adjusting to a new country. It was so great to meet the students, introduce the programs, and tell my story. Lastly, since I’m the first student from my university who study abroad, I hope more students would come later as Post-Professional Master’s students or a SOTI program participants. a picture of presentation about the Post-Professional Master’s Program.